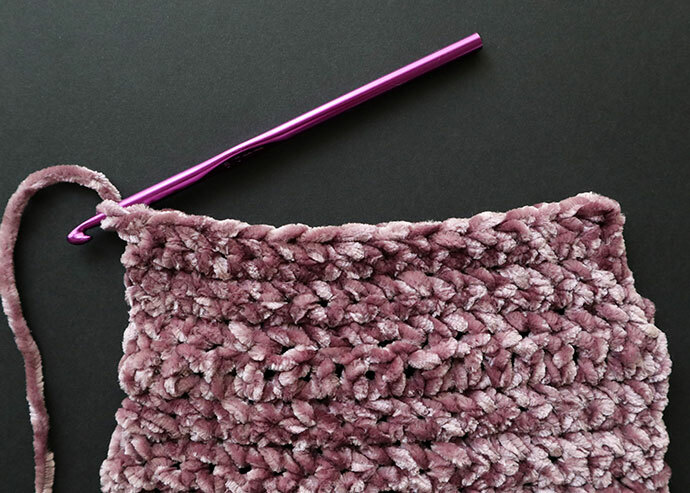 Velvet yarn is the hot new yarn trend hitting needles and hooks as the cooler weather approaches. Its silky feel and luxurious sheen is quite attractive, and Velvet yarn looks great made up in both garment and home decor projects. 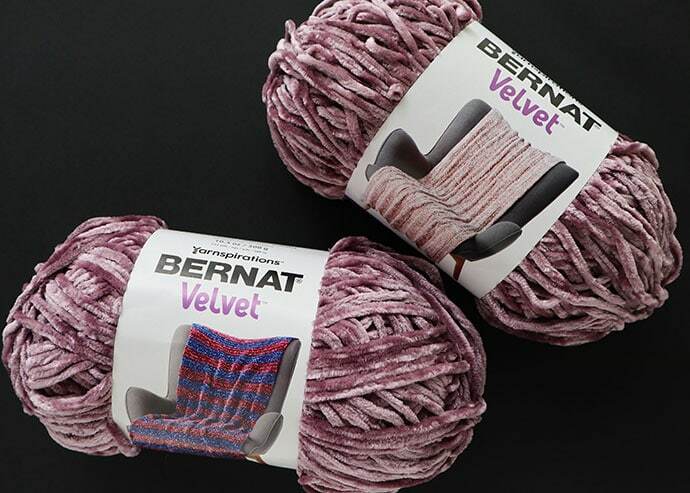 Thanks to American Yarns, who exclusively stock Bernat Velvet yarn in Australia, I tried it out for myself and I have a few thoughts. 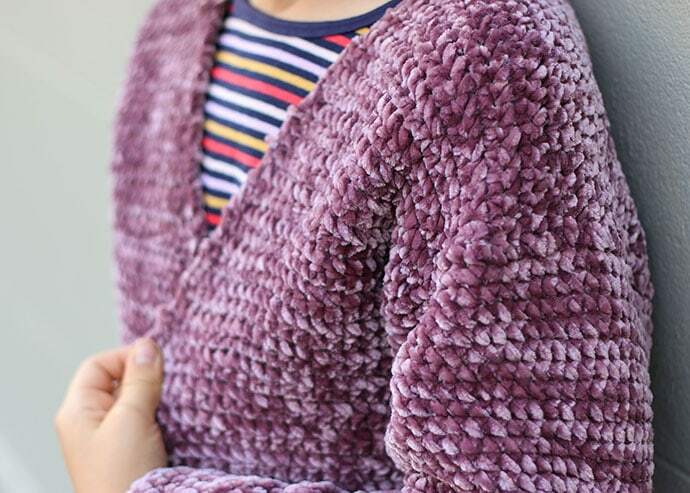 Read on for my full Bernat Velvet yarn review as well as a free Girl’s Crochet Cardigan pattern. As with all my yarn reviews I like to make a project with the product I’m reviewing so I can give you my honest opinion about how the yarn performs, tips and tricks for getting the best results, and a project idea or pattern for you to try. A soon as I touched the ball of Bernat Velvet, I knew I had to make a garment. The soft, silky texture felt lovely against my skin and I couldn’t help but squish the ball against my face. I was originally thinking of making a knitted tank top for myself but as soon as Emma saw the yarn she begged me to make her a cosy cardigan with it. The yarn has quite a ‘feminine’ look which isn’t totally my style, but I think it will appeal to many knitters and crocheters. That feminine style is also reflected in the colour palette which consists mainly of pastel and soft dusty hues. Again not my style, but I can see how many would like it. I picked ‘Shadow Purple’ which suited Emma’s fairer features much better than mine, so I was happy to make an addition to her winter wardrobe. 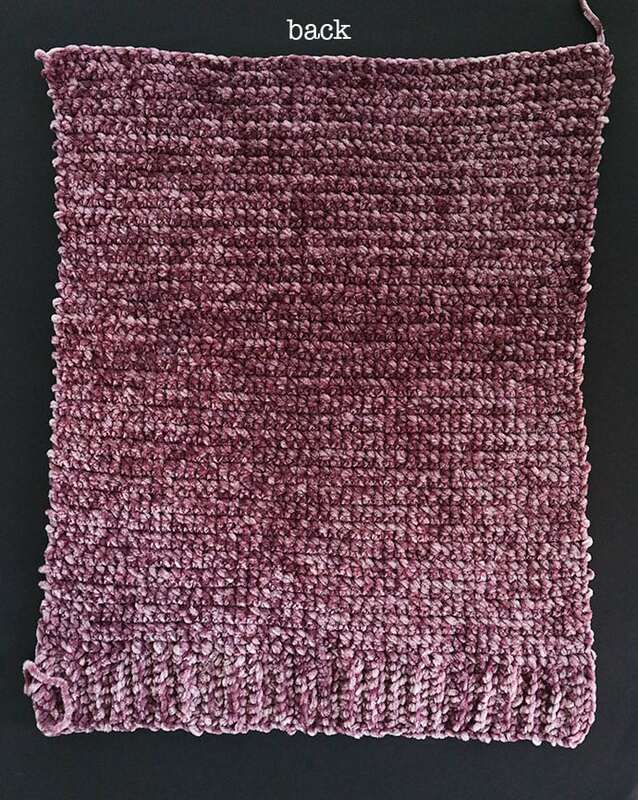 Because this style of yarn was so new to me, I thought a sample swatch would be a good idea to see if knitting or crochet suited Bernat Velvet the best. I’m glad I did because it saved me a lot of frustration down the track. Initially I thought this yarn would look good as a loose knit but boy was I wrong. I quickly learned that ‘worming’ is a problem with velvet yarns. 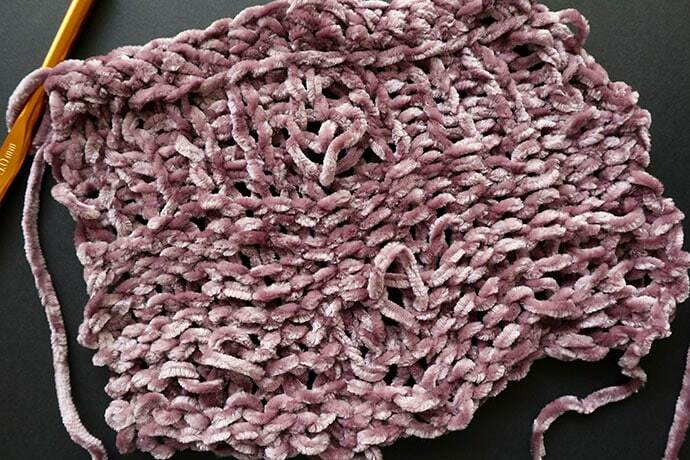 Worming is when a loop of yarn pulls away from the knitted fabric and coils back on itself. It’s especially problematic with velvety and chenille style yarns and slippery/silky yarns like Bernat Velvet are very prone to it. 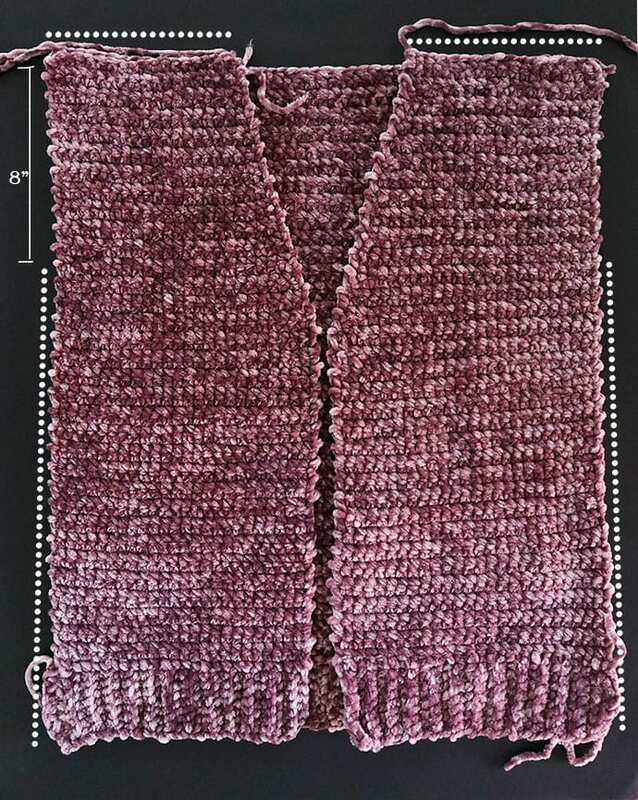 As the fibres in the knitted fabric move against each other, they create large holes and twisted loops. It looks terrible and is very frustrating. Use a smaller hook or needle size than recommended. I found 6mm was the best crochet hook size even though the label recommends 6.5. 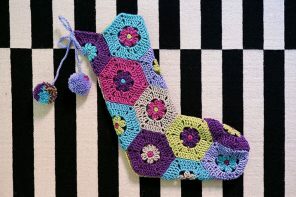 Crochet rather than knit for tighter stitches. The looser the stitches, the more movement to cause worming. 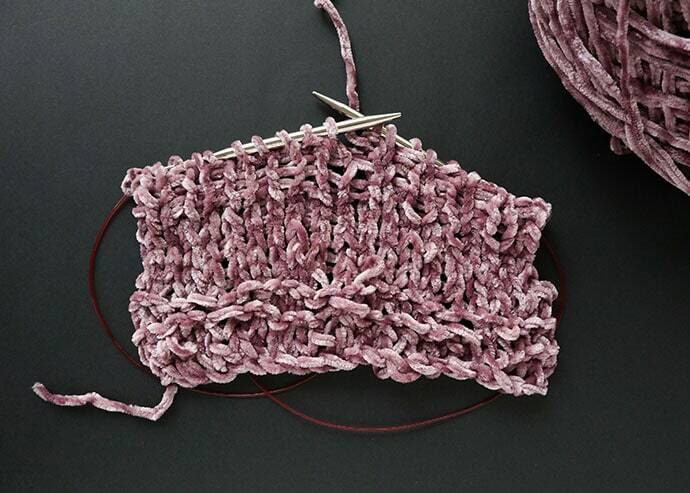 Choose stitches with less loops. 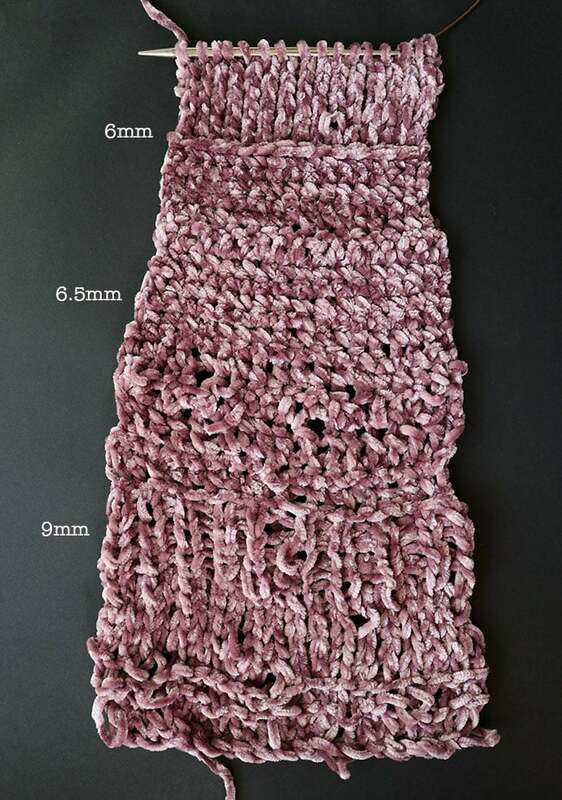 Eg, single crochet performs better than double crochet. As a last resort blend with a non-velvet yarn. Hand wash finished garments to minimise friction that causes worming. As you can see in my sample swatch, the smaller the needle/hook size, the less worming. The 6mm crochet hook produced no worming, the 6mm knitting was better than larger needles but still had a tendency to worming. Unfortunately, the tight tension creates quite a firm fabric without much drape. I’d recommend making your own swatch to determine the best hook/needle size for your tension style. For best results, I’d recommend using this yarn for crochet projects only. 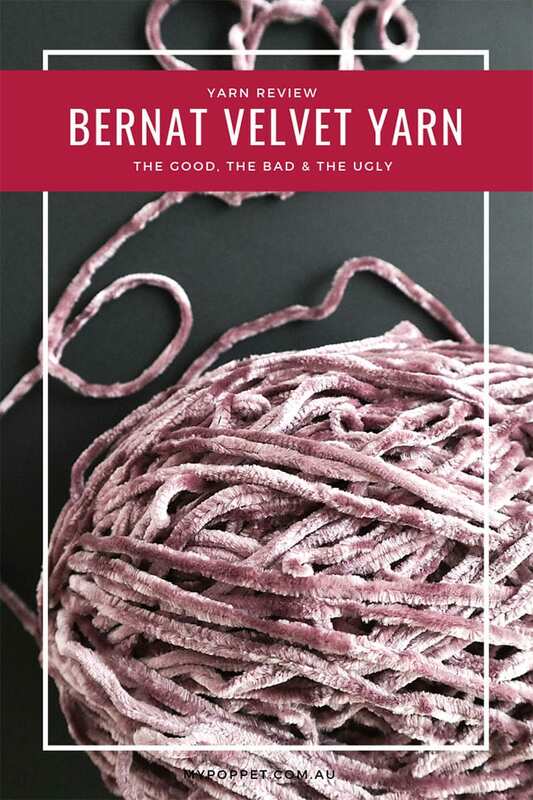 Skip to the bottom of the post for my Bernat Velvet Yarn Review final thoughts. Because Emma wanted a cardigan I was on the hunt for a suitable pattern, but had no luck. The best I could find was a Velvet crochet sweater pattern by Hooked on Homemade Happiness which I adapted to make a cardigan. The original sweater pattern is available in sizes 5-12 but I’ve only written the pattern for the adaptation in a size 12 (XL). I’ve followed the original pattern for the back and sleeves and made up my own for the front pieces of the cardigan. Get the Velvet Sweater Pattern here. 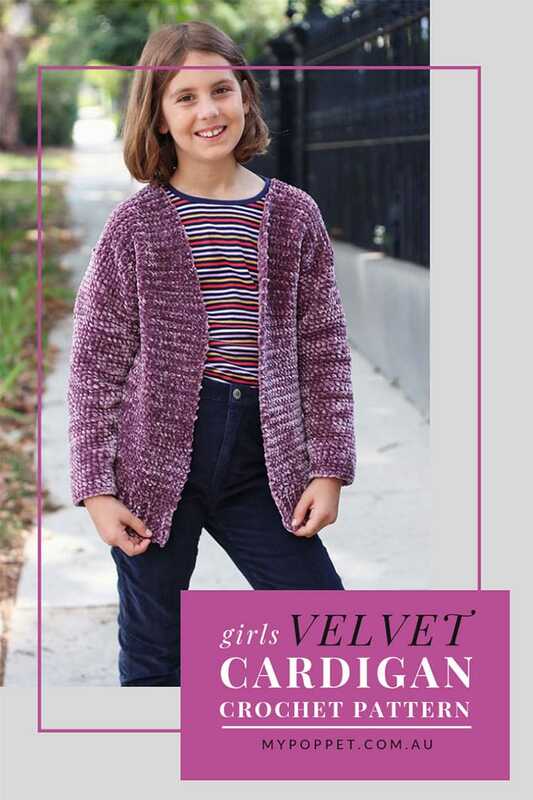 Follow the Kids Velvet Sweater Pattern to make the back panel. It’s a basic rectangle so no fussy shaping. Start at the bottom with a long ribbed band and then crochet along the long edge and work up to make the main body of the back piece. 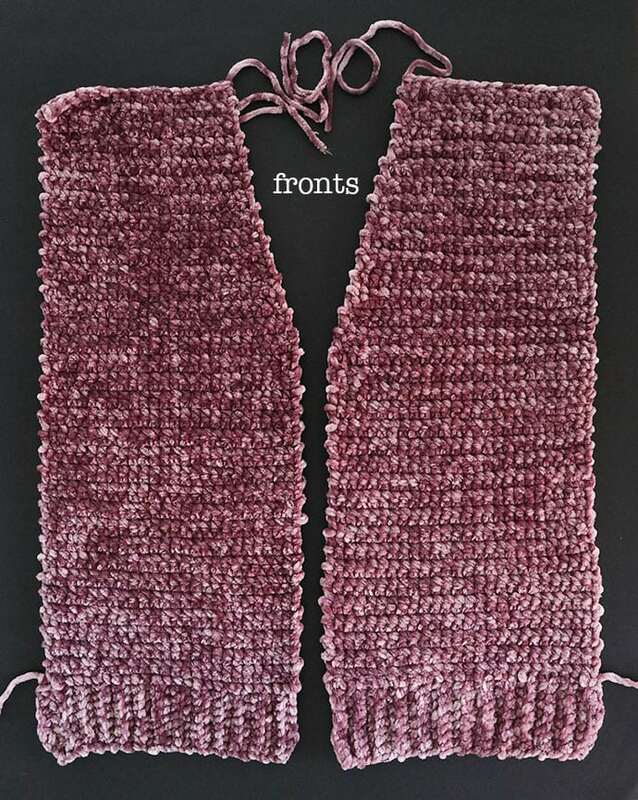 The crochet cardigan pattern for the front panels is as follows. You’ll need to make 2 identical pieces, one is flipped over to mirror the other. 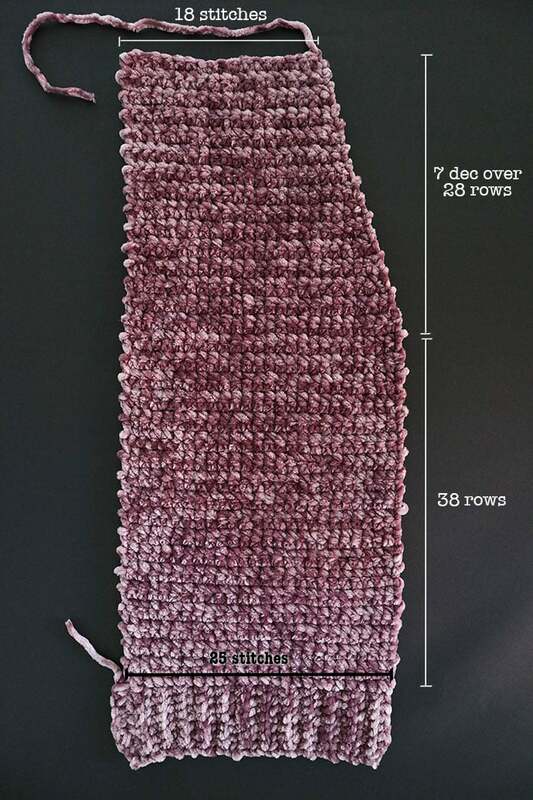 When you are crocheting each panel, decide which will be the right side and the wrong side so if you have to join yarn the knots end up on the wrong side. Lay the front panels on top of the back, wrong side out. Use the long end to sew the shoulders closed with a whip stitch. Sew the sides closed using a whip stitch leaving about a 8” (about 24 rows) for arm holes. 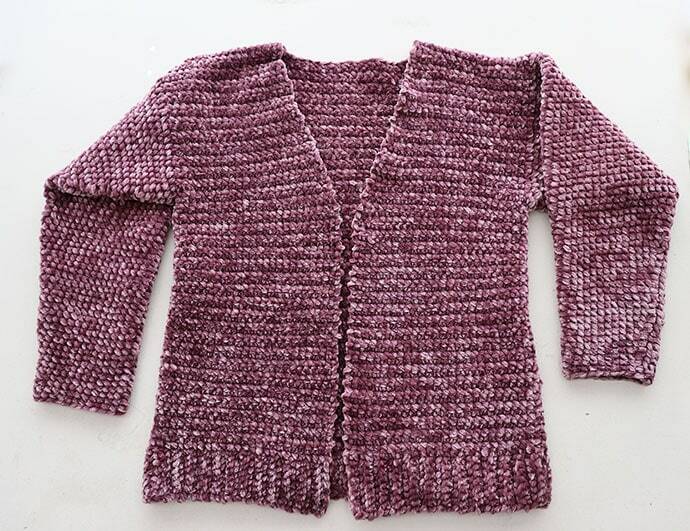 Follow Velvet Sweater crochet Pattern for arm hole instructions. I crocheted 50 stitches around (25 on front and 25 on back). Cuff finished with 24st around. 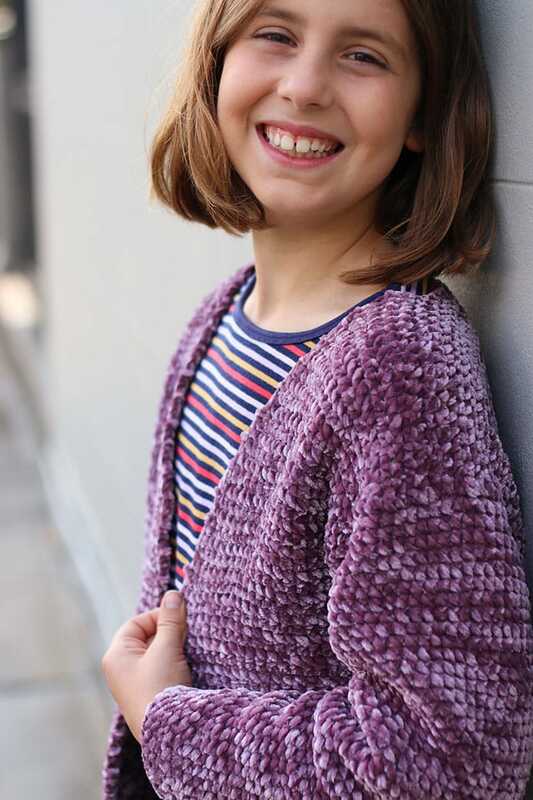 This cardigan works up quite quickly and the design of the crochet cardigan pattern is simple enough that you don’t need to refer to the pattern too often once you get going. Emma loves her new cosy cardigan, so easy to throw on over a t-shirt as the weather cools down. Because the fluffy yarn is nice and thick, it’s super warm. The style is kind of slouchy which is right on trend at the moment. 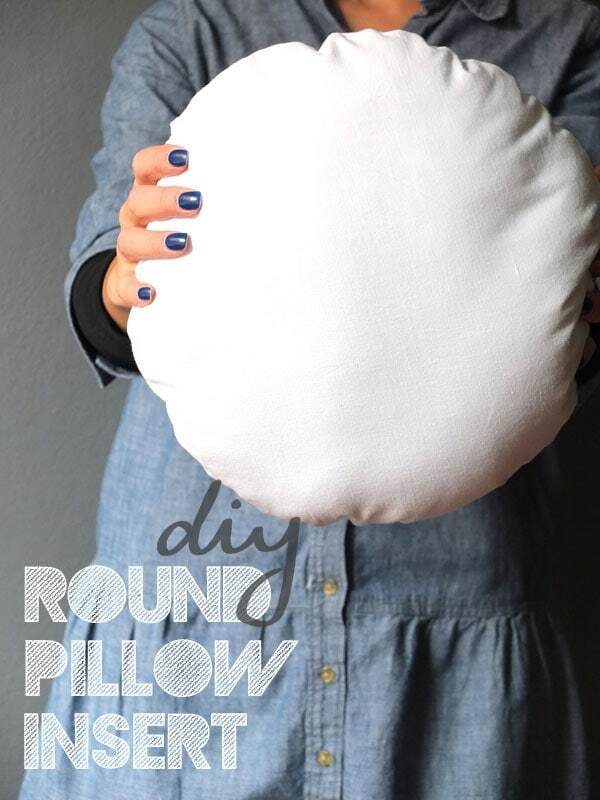 I’m tempted to make myself one now. Bernat Velvet isn’t the kind of yarn I’d naturally go for, but after some initial teething problems, I found it quite nice to crochet with. The crochet cardigan I made turned out quite nice, and Emma really likes it, which is the main thing after all. Thanks for a well-researched yarn review. I’m very impressed with the amount of work you put in, not just in the yarn review itself but the pattern development also. I had never come across the term ‘worming’ before. Do you know where and/or when it first came into use? In any case, you have taught me something new today. Thank you for answering my question “Is it hard to weave in ends?” before I could ask! Your mention of using knots to join yarn made me wonder. I was taught never to join yarn with knots when crocheting because the knots will invariably find their way to the right side. 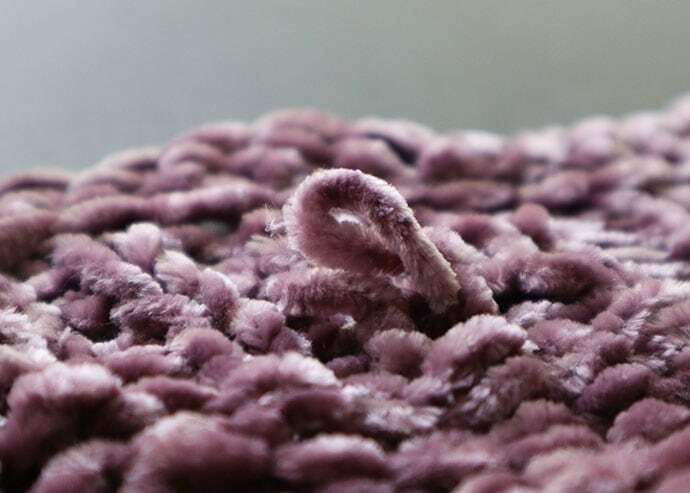 It is nice to see how velvet yarn works up in a garment after seeing it used in soft toys and blankets most of the time. 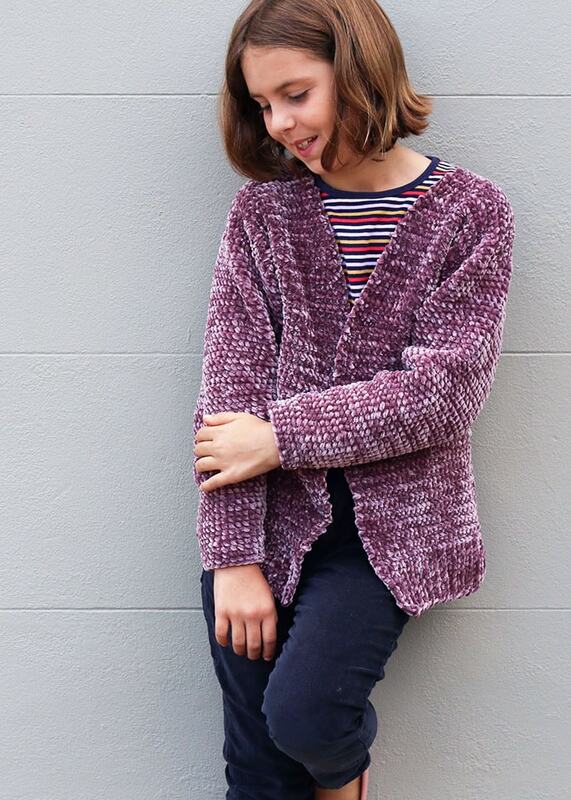 The cardigan looks lovely on Emma and, as you say, if she likes it, then it is a success. 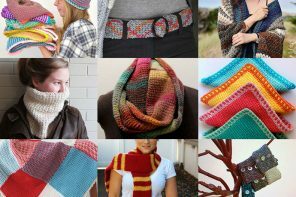 I’m not sure who first coined the term “worming’ but it was hard to find any information as to the phenomena of the loops pulling out of the knitting, and finally found some answers on a ravelry forum re the worming. I’ve just left the knots on the wrong side of the crochet. 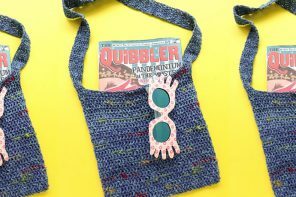 Be inspired by original DIY craft projects for all skill levels. My Poppet is a participant in the Amazon Services LLC Associates Program, an affiliate advertising program designed to provide a means for sites to earn advertising fees by advertising and linking to amazon.com.